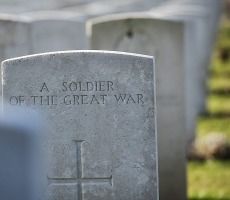 The British public strongly prefer a solemn remembrance of the lives lost in the first world war to a centenary commemoration which places a central emphasis on Britain’s victory of the war, according to new Ipsos MORI polling for British Future. “Our research shows that people strongly believe the centenary should be a moment of national reflection, not triumphalism. A solemn commemoration of the first world war, remembering those who were lost and reconciling ourselves with former enemies, appeals more to the public than marking a victory,” said Sunder Katwala, director of British Future, referencing extensive research conducted into public understanding of the first world war and the centenary, published in our Do Mention the War report. Which of the following, if any, is closest to how you feel Britain should mark the centenary of the first world war? These poll options sought to reflect the public challenges which have been put to existing commemoration plans. Journalist and historian Max Hastings has argued that “Those planning the commemoration feel almost embarrassed that we won the war, and are determined to say and do nothing that might upset Germany, our modern EU partner,” saying that a failure to make victory a central theme would be a betrayal of those who fought, while the No Glory campaign challenges the government’s approach as ‘disturbing‘. Neither the charge of jingoism, nor Hastings’ counter-argument that the centenary programme is not nearly jingoistic enough appear to strike a chord with most of the public. Education Secretary Michael Gove sparked a renewed debate this week, challenging the ‘Blackadder myths’ about the first world war in a Daily Mail commentary. Gove’s Labour shadow Tristram Hunt, a historian, has challenged Gove’s argument in an Observer piece. Hunt’s Labour colleague Dan Jarvis had previously also challenged the Blackadder narrative, making a similar argument to Gove’s, though in a rather less polemic style. Historians have pointed out that the historical debate about the origins of the war is not a left versus right argument, with former Tory MP Alan Clark popularising the idea of ‘lions led by donkeys’, while revisionist historians, such as Haig biographer Professor Gary Sheffield, are not necessarily conservatives. Sheffield debated Gove’s argument with Cambridge historian Professor Richard Evans on the BBC Radio Four World at One programme on Friday. Katwala said that public controversy about the war could improve understanding of the historical debates. “The public see the centenary as a moment which will bring the country together in solemn commemoration. We should certainly also make sure we debate the big historical controversies from our past. The Britain we live in in 2014 was very much shaped by the war of 1914 and its impact on the century that was to follow. Whether or not we should have fought in the first world war is among the most important questions in British history – and many people see the centenary as an important opportunity to learn more about a history that most have a shakier understanding of than they would like. Michael Gove certainly can’t be accused of pandering to the popular side of the debate this week. The poll findings do suggest that the war poets and Blackadder do reflect the dominant tone of how most people do think about the first world war. Historians are probably better placed than government ministers and their political opponents to argue out the controversies, and deepen our understanding of them, but we can all learn something from having these public arguments about how we understand the war’s legacy,” said Katwala. British Future has previously conducted an in-depth study, exploring public knowledge of the first world war and views about the meanings of the centenary. Earlier deliberative research and polling found a strong public consensus on the themes and tone of the centenary, as a previous poll carried out by YouGov demonstrates. Three-quarters of people wanted messages about the importance of peace, the sacrifice of those who died, the opportunity to learn about a shared history and reconciliation with former enemies to be central to the centenary commemorations. Eighty percent of people believe that an emphasis on the Commonwealth contribution can play an important role in integration in a diverse Britain, with just 4% of people opposed to this. However, a centenary theme of ‘victory’ was again found to be a more polarising idea, being important to about a third of the population (33%), with slightly more opposed (35%), and others on the fence. Concerns that a rush to commemorate the war could promote jingoism found minority support of just under a fifth, but most people rejected this. In British Future’s deliberative workshops around Britain, there was more concern about this in Glasgow, among male participants, though the researchers observed a significant gender divide, with Glasweigan women being strongly supportive of the commemoration plans, holding similar attitudes to participants in Cardiff, Birmingham and High Wycombe. The 2014 State of the Nation poll findings, covering a range of key issues and events from the year ahead, will be published in a week’s time.